Though the sight of deer in your yard may be charming, the reason the deer are visiting is to eat some of your plants and trees. Combating the damage they cause is difficult, so it's best avoided by planting species that are not as tempting to the deer's palate. At least 47 deer species -- including elk, caribou and moose -- are contained in the family Cervidae. Most are found in the Americas, Europe and Asia, though there are also deer in a small section of west-central Africa. The digestive system of deer is different from other herbivores like cows; deer have a much smaller rumen -- one of the four parts of the deer stomach. This effectively limits the amount of food that a deer can consume; because of this, the deer have to be more selective in their diet and eat smaller quantities of high-quality food, rather than browse on bulky, low-calorie foods like grasses. The diet of deer depends on the species and geography -- acorns, blackberry, conifer leaves and twigs, and fruit make up a large portion of their natural diet. Deer consume approximate 2 to 4 percent of their body mass daily; approximately four to eight pounds of food per day for a 200-pound animal. Deer are adaptable animals that thrive in suburban areas; even in the wild, deer live along the forest's edge where their preferred foods grow. In many places, deer are destructive to suburban vegetation and can cause land owners considerable grief. 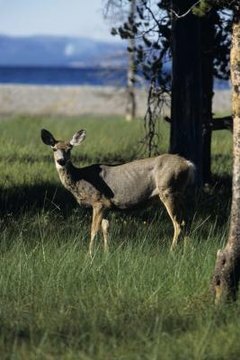 In the United States, the two species most responsible for this browsing are the white-tailed deer (Odocoileus virginianus ) in the east and the mule deer (Odocoileus hemionus) in the west. Some of the ornamental plants that deer are especially fond of include fruit trees, maple trees (Acer sp. ), azaleas, yews and conifers. The Cornell Cooperative Extension estimates that deer are responsible for $2 billion in annual damage in the U.S. alone. While half of this total is the result of traffic accidents involving deer, the other half is the result of the deer feeding activity, which strikes homeowners, farmers and the timber industry. In 1992, the USDA reported that deer cause more widespread damage than any other wildlife. Scotch pine trees (Pinus sylvestris) -- also called Scots pines -- are the most widely distributed pine species in the world. Historically native to Europe and Asia, scotch pines have been introduced in many places around the world and have become naturalized in the Great Lakes region and the northeastern U.S. A number of bird species use the trees as a food source, and people use them as Christmas trees. Homeowners can employ several different techniques for reducing deer damage; some plants like marigolds and periwinkle (Vinca minor) are thought to repel deer. Alternatively, a solution is to plant species that are unpalatable to deer; scotch pine is often recommended in this capacity. In fact, deer will consume scotch pine, but it is not a preferred food source for some species and populations. Some authorities report that scotch pine is avoided by white-tailed deer, while while mule deer consume it willingly. In fact, the Utah Division of Wildlife Resources suggests that scotch pine should not be planted in the range of mule deer, regarding it as a plant that is “highly preferred” by the deer.